Boorom designed and installed a new 125-ton scroll compressor system at the U.S. Postal Service’s Jamaica, Queens facility. In order to reduce concerns about the environmentally hazardous use of Freon, Boorom designed and installed a condenser water control system to cool the facility and added economizers to the existing air handling units. This efficient system reduced the return on investment period from 5.7 years to 3.8 years. In addition, Boorom retrofitted lighting systems and trained staff on the operation of the new lighting system. Concerned about reliability and the use of environmentally hazardous Freon's, the U.S. 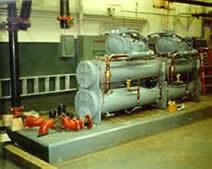 Postal Service installed two new 125 ton scroll compressor systems for cooling their facility in Jamaica, Queens. In addition to the removal of the old components and installation of the new system, Boorom designed and installed a new condenser water control system and added economizers to the existing air handling units. Performance was better than initially expected and the resulting savings improved the return on investmentfrom 5.7 years to 3.8 years. Additional projects at the site included a lighting retrofit and training of the operators.